The students of Haflong Government College at Haflong in Dima Hasao district on Monday staged road blockade demanding repair of the main road approaching the college. The students of the college also demanded the authorities concerned to repair the leaked water pipeline of the Public Health Engineering (PHE) Department which passes along the road. The students under the leadership of the Haflong Govt College Students’ Union started the road blockade programme at 11 am by placing a bamboo-made barricade on the road. The agitating students alleged that the college authorities have miserably failed to repair the road to the college. It has been alleged that though the road repair work was carried out, the contractor engaged in the work left the work without completing it properly. And after one month of the repair, the road remained the same as it was before. On the other hand, due to negligence on the part of the PHE Department, the college road continues to remain in a dilapidated condition as the leaked waters of the pipeline of the department turn the road muddy. Though the students of the college, which is one of the major institutions of higher education in Haflong, have been demanding repair of the road since long, neither the NC Hills Autonomous Council (NCHAC) nor the Haflong Town Committee has given any importance in this regard. Question has been raised that if college students have to come to the street seeking repair of a road in the heart of Haflong town, the headquarters of Dima Hasao district, what would be the conditions of the roads in rural areas. 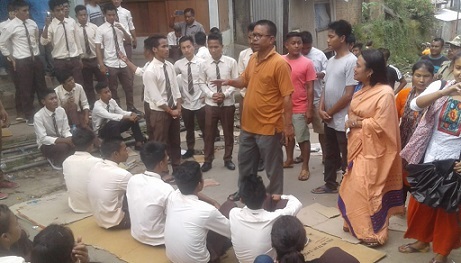 Though the protest site was visited by NCHAC chairman Renu Langthasa and Haflong Town Committee chairman Anil Daulagupu, the agitating students continued to protest.